I thought I'd write a little more about my home-grown x86-64 OS. This is about my threading mechanism. The global task list contains a list of 16bytes entries that contains the adress of the PML4 base for the task and the value of the Ring0 RSP. Since task switches always occur during Ring0, only the RSP0 needs to be saved (RSP3 will have been pushed on stack during privilege change). Upons switching task, the scheduler will restore cr3 and rsp from the list. In 64bit long mode, the TSS doesn't have as much significance than in protected mode when hardware context switching was available. The TSS is only used to store the RSP0 value. When a privilege change is performed, from Ring3 to Ring0, the CPU will load the TSS.RSP0 value in RSP and the old RSP3 value will have been pushed on the Ring0 stack. So the IRET instruction will pop out the Ring3 RSP value (hence why it is not needed in the TSS). The only time that the CPU will look into the TSS is during a privilege switch from Ring3 to Ring0. Only one TSS is needed in the system since the value it contains is a virtual address. Every task will use the same address for RSP3 and RSP0 but it will be mapped differently. So the TSS is only used to tell the process which address to use for the stack when going from Ring3 to Ring0. Since that address is the same virtual address for every task, only 1 TSS needs to be created. Their Code Segment Selector is the same as the kernel. Each kernel task has its own stack. Code is located in kernel memory which is the identity-mapped portion of virtual memory. The RSP value that is set in the Ring0 stack (for iret) upon task creation is the ring0 stack pointer. Their Code Segment Selector is the same for all user thread. The RSP value that is set in the ring0 stack (for iret) upon task creation is the ring3 base stack pointer. When an interrupt occurs, the Trap or Interrupt Gate contains a DPL field and target Selector field. The DPL will always be set to 3 so that any privilege levels (Ring0-Ring3) can access the interrupt handler. The target selector is for a Code Segment Descriptor (inthe GDT) with a DPL value of 0. This will effectively run the handler in Ring0. If the interrupt occured during a user task, the task may have been in Ring3 or in Ring0 if in the middle of a system call. If a privilege change occurs, the value of RSP will be set to the value in the TSS for RSP0. That value is the same for all tasks but mapped differently to physical memory. The ring3 stack will be left untouched. If the interrupt occured during a kernel task then nothing special happens. The same stack is being used and same protection level is applied. Although it would be possible to use the new ITS mechanism to use another stack during interrupt handling. This would be usefull, for example, when a stack overflow occurs in a kernel thread and the #PF exception is raised. If there is not stack switch, then the return address can't be pushed on the stack since the stack if faulty (hence the #PF). So using another stack for interrupts would be a wise choice. But I'm not implementing this for now. A task switch will always be initiated by the timer iterrupt. The scheduler runs in Ring0 so the Ring0 stack is used. If the interrupted task was in Ring3, we don't need to worry about its stack since RSP has been pushed on the Ring0 stack. The current CPU context will be saved on the Ring0 stack. Therefore, the scheduler will always save the RSP value in the tasklist's rsp0 entry since it occurs in ring0 code. Upon resuming the task, RSP will be reloaded from the rsp0 entry, context will be restored and the iret instruction will pop the ring3 RSP to resume execution. Since interrupts are re-enabled and APIC has been ack'd, we will continue to be interrupted by the timer and we are ready to take on a new task at any time. It would be wise to warn the parked CPU about newly created tasks (with IPIs) so we don't need to wait until the timer to kick in. But that's for another day. The problem here is that Task 1,2 and 3 are still running. So doing a context switch imposed a large overhead for no reason. But the fact that they are still running is good, but they are not running on the same CPU anymore. So they will never fully benefit from the CPU cache since memory will need to be fetched all over again because that CPU had no idea about the code and data being used by the task. A better algorithm would detect that the task should continue to run on the same CPU. I need to take the time to think about it. A "non-conforming" code segment descriptor with DPL=3. A writable data segment with DPL=3. This is for the stack. The first 128mb is identity mapped using 2mb pages (first 64 page directory entries). The rest of the available memory is identiy mapped with 4k pages. The whole memory is again identity mapped, using 2mb pages, at 0x4000000000. take the physical address of the kernel page (easy since it is identity mapped) and store it in the process page entry. The process's page now maps to the proper physical page. When creating a new process, the process code will start at 0x8000000. So the kernel will reserve a physical page (as per the process in step 1 above). The physical address of that page will be used in the process's page entry for address 0x8000000. This should correspond to Page Directory entry #64. Since the first 64 entries are 2mb pages and the rest are pointers to page tables, then this virtual address maps to a 4k page. 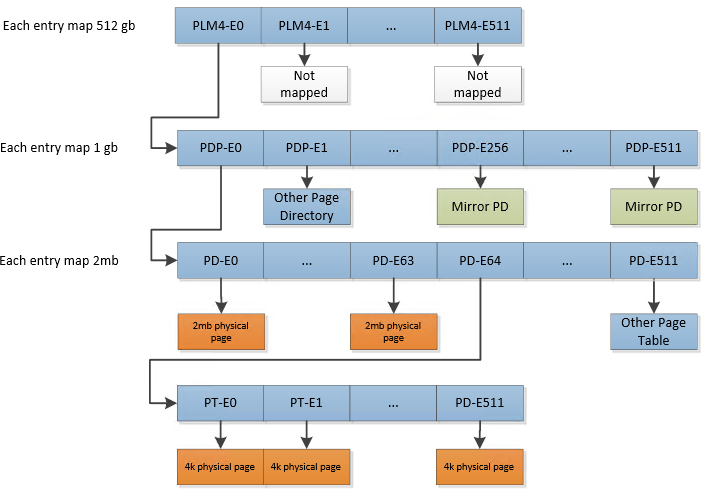 So all processes will see their entrypoint at 0x08000000 but they will obviously be mapped to different physical pages. This allows to to compile position dependant code and run it in the OS. Kernel memory ends at 0x08000000. Kernel page tables are 0x00020000. The kernel page tables is just a list of identity mapped pages above kernel memory with the AVL field indicating if the page is available. The first entry maps to physical location 0x08000000. So when searching for a free page, the kernel will find, for example, an entry at 0x00020B00 with the AVL bits set the "free". This entry maps to 0x08000000+(4096*(B00/16)) = 0x080B0000. The process cannot modify its page table to write an entry for 0x08001000 since its page tables are not mapped. It cannot fill the page with zeros prior to map it since the page is not mapped and it cannot access 0x080B0000 directly because this is a physical address and it would be interpreted as a virtual address by the CPU. The solution is to keep an indentity mapping of the whole memory at some other address. Lucky for us, with 64bit addressing we have a very large address range. So identiy mapping will start at 0x4000000000 (256th gig). That address will map to physical address 0x00000000. So by getting the PLM4 address from cr3 and adding 0x4000000000 (or simply setting bit38), the process can now access its page tables. My implementation is rather simple. It allocates physical pages upon page faults and that's it. The only protection it does is to check if the address is in the page guard. The page guard is a non-present page between the heap top and stack bottom. If a stack operation would fall in that page, then the OS detects this as a stack overflow. But there is nothing that protects a task to do something like "movq $1, -0x1000000(%rsp)". This could fall below the page guard and corrupt the heap. Same thing for the heap. Nothing prevents a task from writting to an address that falls in the stack. So the the page guard is a best-effort method. It's impossible to detect all those conditions. So unfortunately, it is not possible to detect if the demand is for a legitimate stack growth, stack overflow or heap overflow. So we just blindly allocate the page and give it to the requesting task. After trying to find an alternate solution, I found out that apparently Windows and linux are facing the same dillema. Apparently, my algorithm is good. When compiling a C application under those OS, the compiler will detect if the program tries to allocate more than one page on the stack and will generate "stack probing" code. So Stack Probably is a well-known technique to work around that limitation. But if you write a ASM application under linux or windows, then you need to take care of that. Another possible way I will eventually explore is to set the stack memory at virtual location 0x1000000000000. By looking at bit 47of the offending address, I would get a strong hint about this being a stack operation. This means the OS couldn't support systems with more than 256 terabytes of RAM.... It also has other downsides.